In the Desert, USGS Topographic Maps, Free Downloadable Maps, Satellite Map Images. At one time or another we've all used USGS topographic maps in the desert. They now cost about $8.00 each and the topography detail is excellent. Most of the roads trails and POI's (Places of Interest) are noted on the topo maps. They are nice as you can carry them with you, even though they are a little bulky. Now the government has made these same maps (or most of them anyway) available as a free download. We looked at these years ago and decided to revisit them again. We are in the process of planning a trip into a remote area in Nevada for the spring and wanted to see just what would be helpful for our trip. 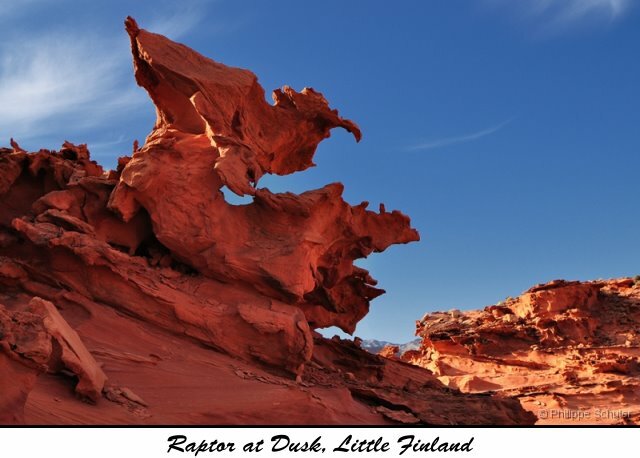 Philippe Schuler, a photographer from France, whom we featured on our site took this photo of one of the formations in Little Finland, also known as Hob Goblin in a very remote area in the desert just north of Lake Mead and 26 air miles south of Mesquite, Nevada. This is a remote area you don't want to venture into without maps. This is what got us interested in making a trip into the area. Now we know why we want to go into this remote area, but what is the best and safest way to get there? And what else do we want to see along the way? Just finding this area on a map is an impossible task as it's not yet listed on any map. So how did we find it? The best resolution of any of the maps on the Internet ( including - Google, Wikimapia, Maps.Google, Bing, and Yahoo) is by far the 3D experience you get in Google Earth. Wikimapia is not far behind as it uses Google maps, just not the 3D maps. The others just don't have the detail. When it comes to a terrain map though you still can't beat a USGS topographic map. But now you don't have to buy them and wait for them to arrive in your mail -- you can download them in PDF format. Then if you want, print them. Here's an example that was blown up 200% (you can zoom in a lot more than 200%) which is something you may need to do to see fine details. This is the Whitney Pocket area and it's famous for the "falling man" petroglyph. It's on the way down to Little Finland and Devils Throat. What is Devils Throat? It's a really neat sink that's over 100 ft. in diameter and 75 ft. deep, with pretty straight walls. It's in a really flat area in the desert. Looks like someone used a giant cookie cutter. We found Little Finland through Google Earth and Panoramio, the site that allows you to put images on the Google Earth map. We saw a lot of photos of the Little Finland in Panoramio. Now the USGS Topographic PDF files have the option of seeing a satellite view of the area as well as a Terrain view. You can use these maps in a lot of different ways including printing them to take with you. Now if you like what you've seen above and would like to take advantage of free USGS maps then continue to page 2 for a simple explanation of how to use them. The topos shown below are a representation of what to expect from the downloaded USGS topos. They are not all the same, which probably depends on the year that these topos were made. One big advantage of downloading these topos is the "Images" view you are able to access in the PDF file. You can switch between a satellite view and a very detailed topography map.